The Daycare Diva's crash course in photography at MDAEYC spring 2014. Being a teacher of teachers has been dream that I’ve been chipping away at for roughly the last five years. There’s something wonderful about giving back to a community of people who have given so much to me. Thinking back to where I was when I first started out on this journey, I am astonished by how far I’ve come and how many people have been there to help me find my way. I am profoundly grateful to each and every one of them. Not so long ago, I couldn't have imagined how I would have found the time or money to attend university, write a blog or get up in front of a room full of my colleagues to share ideas on how they could enhance their programs. Without the support of my husband, family, the really great daycare families in my program and my sisters in the early childhood community- I don’t know how I could have done it. The girls at Joyful Jungle - I've known Racheal for the last six years, she and her girls are pretty fantastic. It's been great to see her blossom into the director of her own center. Through all the ups and downs she and her merry little troupe of girls carry on. After conferences Racheal and I always end up chatting for hours exchanging ideas for projects we're working on, sharing stories about our little people and supporting each other in achieving our goals. So to all of you THANKS A MILLION, you are pretty awesome. Lots of little people will benefit from your kind deeds and words of encouragement. That being said I’m pretty excited about becoming one more voice amplifying the wisdom of the many brilliant minds that have come before me. As I step into the role of becoming a teacher of teachers, I humbly hope to inspire the same level of enthusiasm as the women I admire. It's a beautiful thing being surrounded by so many people dedicated to the purpose of elevating the heart of humanity. While most presenters receive little more than the promise of good karma, they selflessly commit themselves to sharing what they know so that we can be better at what we do. How could you not want to bask in the awesomeness of that? One of those shiny, kind hearted people is Professor Jean Allison from Baker College. This lovely lady gave up time seeing the keynote speaker at conferences to help me trouble shoot some technical problems with my computer and projector. When all of our efforts failed, she located a different computer for me to borrow then she set up the projector and made sure it was working for me. Later in the afternoon I attended her workshop on executive function and metacognition. Her presentation got me thinking about how our curriculum supports executive functioning skills / metacognition and how we can improve. Self regulation - the ability to deal with frustrations when faced with a problem. Memory - storing and retrieving information. Focus - the ability to sustain attention on a task for an extended amount of time. Ability to plan - time management - understanding sequence of events. Integrating knowledge - taking information from several different sources and using it in a new and different way. Metacognition is thinking about thinking - in other words helping children realize when they are thinking, helping them to think about what and how they are thinking, then endowing them with strategies for thinking more effectively. It's pretty heavy duty stuff. Teaching them coping skills for dealing with the stress that naturally arises as they figure things out for themselves. Metacognition is important because kids who can manage stress better are more capable of being persistent, thinking creatively and generating innovative ideas. 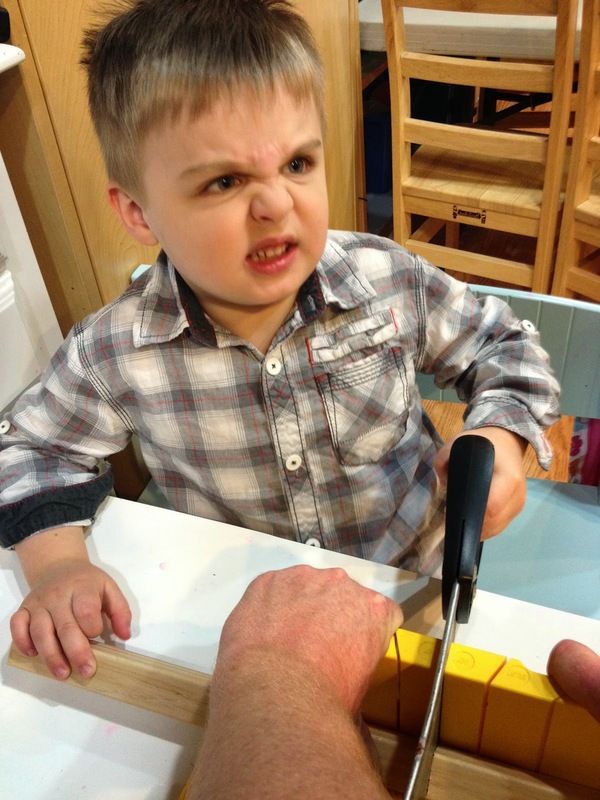 Learning to use a saw can be very challenging, it's much harder than it looks! Working on projects that are both engaging and challenging helps children work through the frustration of not being able to be immediately successful at something. “Let’s check your work.” When children say they are done with their work, we can use the phrase “Let’s check your work” as we take them back to the job and have them look around to see if the work is actually completed. The activity encourages children to self correct and be accountable for their work instead of having the adult do all the thinking. “What problems did you identify?” Instead of pointing out the obvious problems the child faces while working on a project, let him struggle a little and encourage him to notice problems on his own. If he looks for some time but has difficulty identifying the problem model “noticing” as a means to identify problems then allow him to solve them. “I’m skeptical, why do you believe this?” Playing the part of the skeptic encourages children to examine their beliefs so they can gererate innovative ideas. It also demonstrates the idea that skepticism is an important tool for analyzing the validity of the information they are presented with. “Tell me why you think that?” Whether a child is correct or incorrect in her beliefs encouraging her to express her ideas gives us insight as to where she is coming from so we can help her integrate new information into what she already knows. “I need the details.” Identifying and expressing the details of a situation helps children think critically about the beliefs they hold to be true. It also illustrates the concept that in order to be persuasive a person needs to be able to support her argument with evidence. Humanitarian: Notices when things in the environment need to be done and does them. For example the humanitarian is responsible for noticing trash on the playground and cleaning it up. Negotiator: Helps children solve disputes. Professor Allison encourages children to use the phrase “I need to confer with the teacher” as a pause in the problem solving process when the negotiator is unsure of how to help peers resolve conflicts. Adults are on standby to consult in generating a solution but the children are still responsible for resolving the dispute. Safe keeper: The person who keeps people safe by noticing unsafe things in the environment. Friend: Is a friend when other children need a friend. Great for kids who are socially awkward or don’t come easily to making friends. Greeter: Greets friends in the morning and asks children how they would like to be greeted so that they learn to communicate, respect and respond in a way that their peers are receptive to. Problem solver: Helps children solve problems in the physical world such as figuring out why the block tower won’t stand. Our group is small so we will be using a much less formal way of incorporating the jobs into our daily activities but so far it’s been a smashing success!